When it comes to bridal jewelry, engagement rings and wedding rings both get a lot of attention. They are both important parts of the marriage custom and are jewelry you'll wear for the rest of your life. However, as you shop, you may begin to wonder whether you need two separate rings for this event. Choosing wedding and engagement rings can be difficult, and it's essential you understand how the two differ before you begin to shop. Keep the following main difference in mind. Engagement rings are traditionally given as a symbol of betrothal, sometimes years before the actual wedding takes place. The ring, usually worn on the left ring finger, tells the world you are engaged. In general, only women wear engagement rings, although some couples are choosing rings for men, too. 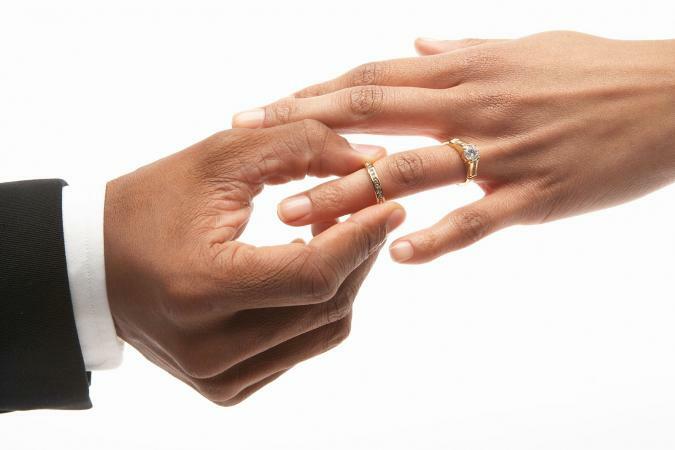 Wedding rings also go on the left ring finger in many cultures, but they are exchanged as part of the wedding ceremony. Only married people wear them, so they symbolize the commitment of being married. Often, both spouses wear a ring. There are no official style rules for engagement rings and wedding rings; however, they generally fit into some basic categories. Engagement rings usually feature a center gem or design, which is wider and/or taller than the band that supports it. It may or may not include other decorations or gems. A wedding ring is usually a band without a clear focal gem. It may be engraved or set with diamond and other gems, or it may be plain gold or another metal. Some designs are made to wrap around the engagement ring to create a single ring. The average cost of an engagement ring, according to The Knot, is about $6,400. There's a lot of variation, however, as some couple prefer tiny gems and others want to make a statement. Even if it features diamonds or other gems, a wedding band is usually considerably less expensive than an engagement ring. According to Long's Jewelers, the national average cost for a woman's wedding band is just over $1,400, while a man's band is about $550. There's no rule that says you need to buy your engagement ring before your wedding band. In fact, you might find a wedding band you love first and set it aside for the big day. You can also buy the rings at the same time, ensuring they will have a cohesive look. Many engagement rings come as bridal sets. The engagement ring itself is often fairly simple, but it comes with a wedding band that perfectly complements the design. It often includes side gems and decorations to add to the look of the original engagement ring. In some cases, the wedding band will be a wrap style that goes around the engagement ring. Do You Need Two Separate Rings? Even though it's traditional to have a separate engagement ring and wedding ring, there's no rule that say you have to do it that way. You may not want to wear both rings for the rest of your life. Instead, you can choose not to have an engagement ring and just have a wedding band. Or you might decide to buy an engagement ring and wear it on your right hand before the ceremony and your left hand afterward. As with most things wedding-related, it comes down to personal preference. Your choice of wedding and engagement jewelry is up to you. Take some time to think about the differences between these two important rings and whether you want to separate pieces of jewelry. No matter what you decide, you'll end up with a ring (or rings) you'll love for many years to come.